Just returned from a trip to Spain. We spent two days in Granada and two in Malaga. We used the free ticket I won from Swiss International Airlines for my “Flowers in Your Horns” music video about going to San Francisco (I won one of the runner-up prizes). In Granada we just relaxed. We tried to go to the Alhambra, but you need to reserve tickets in advance (they sell a limited number of same-day tickets, but we were not successful at getting them). They have a good website so you can order in advance. We didn’t have breakfast in the hotel, opting for local cafes instead. 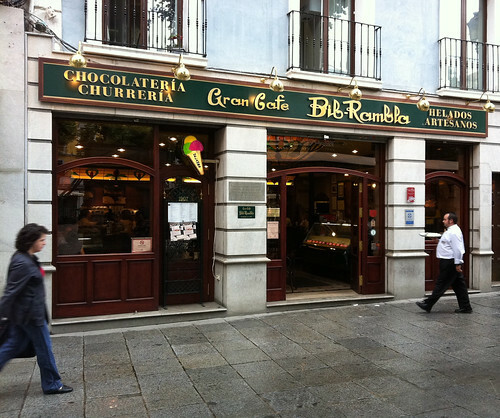 On the first day we went to the Gran Cafe Bib-Rambla, a historic cafe on Plaza Bibrambla, and sat outdoors. I had Churros with chocolate and they were excellent (unfortunately my photos of the cooking process did not turn out, but you can go into the cafe and watch). I am not sure I would want to eat them every morning, but these were really good. The next day we stood at the counter inside (watching the cooking process) and had coffee con leche with chocolate croissants. The cafe also has ice cream which looks delicious. We had dinner in a wonderful place called La Oliva. 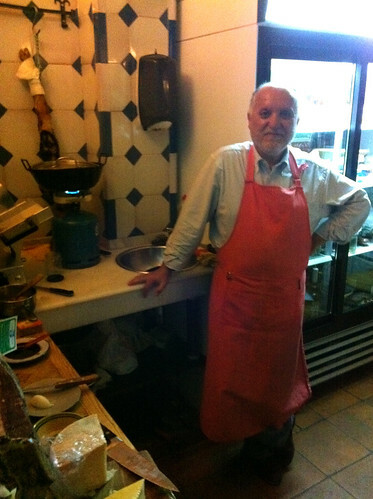 It’s actually a food shop whose owner, Francisco, will cook dinner if you call and arrange in advance. We enjoyed an 11-course (probably, we lost count) dinner with wine that he prepared using ingredients from the shop and a simple one burner camp stove. He only has two tables and dinner is really an experience accompanied with Francisco teaching you about traditional food and wine from the region. We spent a lot of time walking around the area of Albaicin, which is a neighborhood located on the north side of the Alhambra. It’s a neighborhood built on the side of a hill with narrow winding streets. Lots of scenic vistas towards the Alhambra, historic churches and buildings, and some shops. We walked down to the Plaza de los Tristes, a square filled with restaurants along the Rio Darro. Then up a street called Calle del Rey Chico up to the Alhambra visitor center. Since we could not get tickets we spent some time in the excellent bookstore so we know what to look for on our next visit. 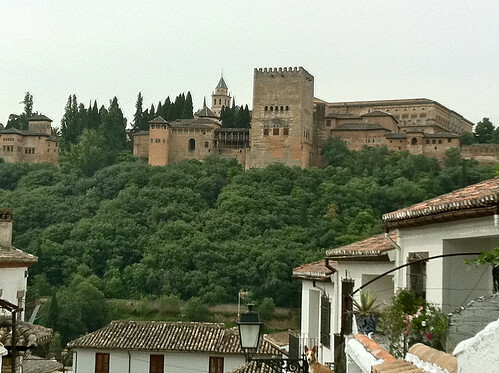 The Alhambra from the Albaicin neighborhood. Walking down from the Alhambra to the Plaza Nueva, we had some superb Gazpacho soup served in a glass (to go!). We went back to ask how they made it and after trying to speak English a little, the proprietor asked if we spoke German, which he spoke fluently. We got the recipe quickly: one (only!) clove of garlic, fresh tomatoes, old bread (soaked in water), olive oil (the quality of the olive oil determines the quality of the soup), salt and pepper. We made it when we returned to Vienna and it was pretty good. I still like my version with more garlic and green peppers/cucumbers etc. but that’s cooking isn’t it? One of my favorite foods is tapas. In Granada whenever you order a drink you get a free tapas. And, we are not talking about a small bowl of peanuts. Many of the free tapas we had were quite substantial. You could easily make a meal of free tapas going from one bar to another. We did this with the friends we were visiting and it was lots of fun, not necessarily a balanced meal, but order a couple small plates to go with the free ones and you will do fine. We visited the Bar Los Diamantes (which is in lots of the books) and it was great: busy, fast, casual. We ordered two beers and were immediately confronted with a rather large plate of deep-fried calamari. True, it made us want to order another beer, but then we received a plate of zucchini (also fried). 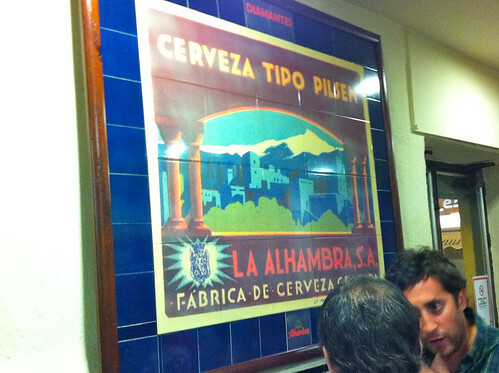 The beer was an excellent local beer called Alhambra. We really loved Granada and hope to visit again soon. All my Granada photos on flickr. We took a local express bus (2 Euros) from the airport to the intercity bus terminal, then took the intercity bus to Granada (10.01 Euros, the 1-Euro-cent is kind of odd, we did not pay it when we went to the ticket window, but I did have to pay it when I went to a ticket machine to buy a return ticket). We took a cab to our hotel (8 Euros) since the Granada bus terminal is out of the city center. The bus schedules are not well coordinated so we waited about 30 minutes at the Malaga airport (we just missed the bus) and about 45-minutes at the bus station (buses leave for Granada about every hour on the hour). We tried to buy a ticket on-line for the return trip but the website was not accepting credit cards; we bought a ticket at a machine at the station which was fine, the line to buy a ticket in person was incredibly long. We stayed at the Room Mate Leo hotel, which was very nice. As the on-line reviews say the staff is really great, for example, they spent lots of time trying to reserve bus tickets for us (and other guests).